The entrance to a person’s home says a lot about their taste, style and personality. Express your dedication to the finer things in life with the GateCrafters Stainless Steel Digital Keypad. 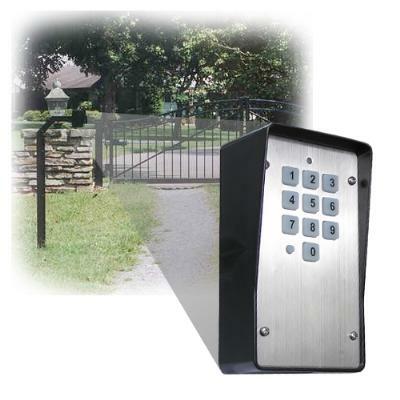 Not only will a polished steel keypad embellish your gateway but it will also add the comfort of knowing you have a device of superior quality and security regulating access to your property. The GateCrafters Keypad holds up to 60 individually editable codes. Keep your immediate family code close while retaining the freedom to create and erase codes for parties, friends, distant relatives, deliveries, lawn care, employees, service calls, or any other use. Those without codes will be deterred from tampering by a temporary security shutdown after a string of incorrect codes are entered. Plus the heavy-duty frame will keep your digital keypad functioning for years to come. The GateCrafters Keypad is simple to mount, program, and use. It only takes a few short steps to program your keypad and also to change no longer wanted codes. Installation is completely wireless so there are no clumsy cords or burying of wire. There will be no more fumbling around in the dark; the keypad comes standard with an internally lit keypad for easy nighttime usage. "The GateCrafters Stainless Steel Keypad is one of our most popular and versatile products. It is purchased across the board with every gate opener we carry to control th access to our customers properties. One of the main reasons people buy it is its durability. First of the face is stainless steel, secondly the housing is made of the same type of plastic they use to make hockey pucks. Although we do not recommend letting your kid smack it around the driveway while playing roller hockey, it is probably the most likely keypad to come out of the abuse functional. It is siple to set up both wired and wirelessly and fully explained how to do so in our Gate Crafters.com accessory manual. If you get caught up on a section of the manual, even on the weekend, we are just a few strokes of the telephone keypad away. We take great pride in knowing our accessories and understanding how they work. The WKP-P has been thoroughly tested by myself and my team and meets our high standards for recommended accessories." **Compatible with Apollo’s sold through GateCrafters.com, all distributors include the frequency of their choice with Apollo Openers.